The computer is undoubtedly among mankind’s most important inventions. The ability to compute and store data provides us with the ability to tackle problems that would likely be impossible to handle otherwise. It’s hard to imagine scientists looking for the Higgs-Boson with nothing more than typewriters and legal pads. You can spend years delving into the history of the computer. There are tons of inventions, tons of books about them – and that’s before you start getting into the finger-pointing that inevitably occurs when a team of engineers creates something wonderful and only a few are given credit. With that said, I’ve tried to sum up computer history by highlighting thirteen particularly influential computers. Early computers were electro-mechanical, which means they used mechanical components as part of the computing process. The Harvard Mark I was one of many such machines, but it is unique because a team of engineers at IBM were involved in its creation. The 5-ton computer, completed in 1944, read instructions via paper taper. It lacked many of the features of modern computers but inspired additional work both at Harvard (where it ended up) and at IBM (which helped to engineer it). 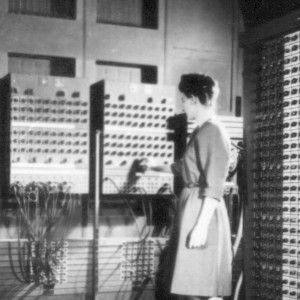 ENIAC was the world’s first electronic general-purpose computer. It was digital, fully programmable and Turning complete. The massive computer, which weighed about twenty-seven tons, dwarfed the computational power of previous computers. Although used primarily to help the United States military with artillery calculations, the first problem assigned to it was related to the design of the hydrogen bomb. A number of improvements were made to the computer over the years, the most important of which was likely the inclusion of a stored programing mechanism in 1948. It was not, however, the first computer to have this feature. No, that honor goes to the Manchester Baby. This experimental computer became operational in mid-1948 and was used as a testbed for a new technology known as the Williams Tube. This cathode ray tube could be used as short-term memory. This mean it was possible to load programs into computer memory, which were then read. The limitations of the Williams Tube meant the programming process was still laborious, but it was an effective proof of concept. It lead to the Manchester Mark I, which improved on the concept of electronic storage by adding a magnetic drum. Early computers built in the 1940s were government programs usually funded by a national military, but commercialization quickly developed. The first commercial computer was the UNIVAC I, which was built for a division of the Remington Rand company (yes, the same Remington famous for its firearms). UNIVAC won a major pop-culture victory for computing when it accurately predicted that Eisenhower would win the 1952 United States presidential election. This was contrary to the most popular human predictions at the time, which favored Adlai Stevenson. Today we are used to thinking of our computers as an ecosystem, but in the early days of computing most machines were one-off models. A program developed for a computer would only run on that computer. The IBM System/360 mainframe computer sought to change that. It could be ordered in a variety of models with different processing power, but each machine was compatible with the others, which meant applications developed for any one machine would work on any variant. This development contributed to IBM’s financial success and inspired the adoption of this approach in future computers. Most computers that have changed history were not mere prototypes, but the Dynabook is the exception. Shown in 1968 by Alan Kay, this concept computer featured a display and keyboard attached on a single slate. It was small enough to carry with one hand but contained the two major user interface elements of the day – a display and keyboard. There was no way to make the Dynabook with technology from that era, but its design was a major influence on Steve Jobs, who admired the prototype’s simplicity. Every tablet computer designed since 1968 has some debt to pay to this design. The late 70s saw a plethora of personal computers hit the market, many of which were successful. Among them, the Apple II arguably was the most influential. This computer did not just attempt to make the computer affordable for the average person. It also tried to make the computer approach work for the average person. Its production run did not end until 1993, at which point nearly six million had been sold. This was the computer that gave Apple the lion’s share of its early profit, providing the funds needed to pioneer other important PCs. The 1980s were the era of the IBM-Compatible PC. It all started with the IBM 5150, the first product introduced to the IBM-Compatible platform. The IBM 5150 was not a particularly revolutionary computer on its own, but it did feature everything that was needed from PCs at the time, such as a powerful 8088 CPU and an available floppy disk drive. It was followed by a number of additional IBM products throughout the 1980s and a hoard of IBM-compatible models made by other manufacturers. The 5150 pioneered the PC as we know it today – a platform that can run common software despite differences in hardware. The 1980s also saw the rise of portable computers. The most influential of these was probably the Compaq Portable. Released in 1983, the IBM-compatible Portable was a commercial success. It featured all the hardware a modern user expected and was compatible with common software. Portable was a relative term, of course – this PC weighed 28 pounds and was the size of a large suitcase. That was tiny for a PC in that era, however, and a wide variety of similar devices were constructed over the next decade. The Macintosh was not the first personal computer with a graphical operating system, but it was the first to catch on. The command line was banished in favor of attractive on-screen graphics and the mouse was introduced for navigation. Apple’s release of the Macintosh was announced by the famous “1984” advertisement. This gained major press attention and made the original Mac hugely influential, however, it was troubled by the fact that software from the era was programmed to run in a command-line interface. Apple reached out to some developers to solve this problem, one of which was Microsoft. Redmond made a fair bit of money by porting its productivity software to the Mac. In 1989 Compaq yet again pioneered a portable computing approach with its new LTE. It was notably the first notebook computer, but it became the most successful and influential of the early models. This was due to its hardware features. The LTE had everything needed including a floppy drive and hard disk. The LTE spawned follow-ups from numerous other manufacturers. Few could have guessed that this tiny, 6.7 pound computer would found a form-factor that one day would top the popularity of desktop PCs. ATX is a form factor specification by Intel. It specifies the size of the motherboard, where the holes used to attach it to a case are located, and the location of various expansion slots. There are also specifications for the power supply and some other components. It took over for the AT form factor and became the default for all desktop computers in by the late 90s. This not a computer, obviously, but it’s as important to the computer’s evolution as the first IBM-compatible PC. It’s the reason why there are no longer multiple manufacturers developing their own different computers with custom hardware and operating systems. The ATX form factor has conquered nearly all computers and “Wintel” – the combination of Windows running on Intel hardware – has become the dominant platform. Apple is the only companies that continues to sell hardware with its own operating system installed. The release of the iPad has already had an obvious impact on the computer industry. Microsoft is rushing to meet it with Windows 8 RT What's the Difference Between Windows 8 & Windows RT? [MakeUseOf Explains] What's the Difference Between Windows 8 & Windows RT? [MakeUseOf Explains] With the Surface tablet announcement a few weeks ago and the final release of Windows 8 looming ever closer, some people are understandably going to be confused about the various versions available. I'm here to... Read More and a number of Android alternatives are already on the market. It’s hard to say what exact impact the iPad will have, but we can say it’s already had an impact. The Dynabook has finally arrived and is available to consumers. It’ll be interesting to see what new designs are introduced and how they change traditional PCs. Obviously, a short look at computer history can’t cover everything. If you know of a computer that you particularly admire, I encourage you to post about it in the comments and tell us why you think it is important. Image Credit: All images are public domain or are from Wikimedia Commons and used in accordance with GNU 3 Popular Image Licenses You Need To Be Familiar With Before Using Someone's Photos 3 Popular Image Licenses You Need To Be Familiar With Before Using Someone's Photos Read More license 3 Popular Image Licenses You Need To Be Familiar With Before Using Someone's Photos 3 Popular Image Licenses You Need To Be Familiar With Before Using Someone's Photos Read More . u are not gud at troling kid, pls jus stop. Great article that should have included the IBM 1401, the first computer with mass business appeal. Also, IBM based its price on a woefully inaccurate sales forecast. They predicted that they would sell/rent around 2,000 and sold/rented somewhere around 22,000. The windfall profits made their future massive R&D efforts possible. Cray - The Supercomputer Company, how could you talk about the history of computing without at least a mention of what Cray has accomplished! What Seymour Cray accomplished with his vision is astounding, from the 70s to current times, they offer computing for research that almost looks like lightning in a bottle! True, Cray totally deserves a mention in an article like this! Too bad the 90s hit them so hard. You forgot the EDSAC! Possibly the first computer to have a programmed game in 1958, Noughts and Crosses. I know this is one of those "fishing for comments" lists that every online publication feels they should do every once in a while nowadays. I'll bite. No mention of Commodore = FAIL. Without Commodore there would have been no MOS Technology. Without MOS Technology, no 6502 processor. Without 6502, no Apple 1, no Apple II. Probably no Apple, period. It's true that the PET-2001 and the TRS-80 came out around the same time as the Apple II, so I can understand if you're an Apple fan you want to use the Apple II as a representative of that era. I'll forgive you for not mentioning the KIM-1 because outside the world of hardware hackers, few people realize(d) how significant it was. I could even kind of forgive you for not mentioning the various types of Amiga because Commodore didn't do that good of a job marketing them either (or we'd all be using Amiga compatibles by now -- arguably). The editor seems to be living in Apple-World..
BTW if it wasn't for Commodore/MOS Technology there never would have been an Apple II as the 6502 CPU in it came from Commodore/MOS Technology! Errr glaring omission.... Colossus - to quote wikipedia "Colossus was the world's first electronic, digital, programmable computer. Colossus and its successors were used by British codebreakers to help read encrypted German messages during World War II. They used thermionic valves (vacuum tubes) to perform the calculations. Colossus was designed by engineer Tommy Flowers with input from Sidney Broadhurst, William Chandler, Allen Coombs and Harry Fensom, at the Post Office Research Station, located at Dollis Hill, to solve a problem posed by mathematician Max Newman at Bletchley Park. The prototype, Colossus Mark 1, was shown to be working in December 1943 and was operational at Bletchley Park by 5 February 1944. An improved Colossus Mark 2 first worked on 1 June 1944, just in time for the Normandy Landings. Ten Colossus computers were in use by the end of the war." I know, I know. I only had so many slots to dish out and I though the ENIAC was slightly more important to computer history simply because it seemed it translate more directly to later projects, though that's also arguable. Ultimately, I agree the Colossus is awesome and I would have included it if I had room. Drop the ipad from the list, you will have room. This (expensive and useless) toy has nothing to do in this list. Nothing to do with 'slots'. You Americans think that the USA is the centre of the universe and it ain't !!! Just admit it and stop making dam silly excuses.. I don't agree. Netbooks only showed that people want cheap computers but were themselves fairly poor products and ultrabooks haven't proven themselves yet. Awesome article, now please write about what are servers and what they do . I don't see the IMSA 8080 on here. This one was a ground breaking computer considering it predated all other home computers and was a star in War Games. Do you really think the IMSA 8080 was a big event in computer history, though? I mean, on the level with the others here? I know it was in Wargames but it was a bit old even at the time it was included. The IMSA 8080 was the computer that started personal computers. So yes I believe it deserves mentioning. What about the first Personal Computer, the one that Olivetti make, "Olivetti 101" that anyone could do a little microprogram in? John F. Kennedy one said "There's will be a maximum 5 personal around the World"
Bill Gates once said that no computer would ever need more than 16MB ram. He also said that the internet was a fad. I'm not sure what the source is for the Internet quote, but actions speak louder than words. Microsoft pushed the Internet heavily in the 95/98 era and is partially responsible for its widespread adoption today. Okay, so I can't find any hard reference to the Internet quote, except that it appeared in newsweek in 1993, 1994, or 1995. But that would make sense if the original was published before the internet caught on and it was never digitised. I'll admit that I was wrong about the 16MB quote, it was actually 640Kb and Gates never said it. Interestingly enough, Gates has been quoted denying the 640Kb quote, but I haven't seen any comment on the "Internet is a fad" quote, despite the fact that the former quote happened over 10 years before the latter. Odd, this comment was supposed to be posted to the main thread. To to solve nonlinear transient dynamics problems for crash simulations early on I used a Tektronix 4014 dial-up console at 2400baud. This would connect via phone lines to CDC Cyber 176 & 760 in another building. Since most problems would run out of core so console operators had to be sent commands to mount external drives which looked like a cake dish and cover being dropped into a washing machine. Cybers had a 60-bit word. Replacing the above, due to model and solution restrictions, I used MicroVax II computer (32 bit word) tied to a Tektronix 4029 Graphics tube to solve nonlinear transient dynamics problems for crash simulations. This was a primitive engineering workstation for the solution side whereas I used a Pr1me computer tied to a Lundy graphics tube to generate the simulation models. These devices were tied together via "DecNet" a cousin to ethernet. A Prime 450 was part of the network and it was communicated to by means of a Western Electric paper tape console. In an effort to move up in "crunch power" an Apollo workstation was evaluated but later dropped in favor of a new Cray XM-P for a tentative "shared" solution. It was quickly evident that our demand alone captured much of the compute power. With simulation models becoming more robust and the iterative solutions more taxing, I was removed from the Cray in exchange for a dedicated Convex C2 with 4 CPUs. This supported our department's needs and the model solutions guided design efforts for huge savings. One thing to keep in mind is that simulations involving thousands of iterations to reach a solution varies wildly in significant digits thus leading to large errors including failure of convergence. Please stop including iPad in the same category as Apple II, iPad is just a toy with big marketing, is as much of a personal computer as any smartphone or a modern game console like PSP. Nice read. Just a typo. When describing the ENIAC, the second line reads "Turning complete" with a hyperlink. Has to be "Turing complete". Wonder what's next?! Harvard Mark I to the Apple IPad - remarkable!